The 7-inch GPD Pocket mini-PC is now available to order for US$500. The device was previously available only to early backers of its crowdfunding campaign. We reported on Chinese company GPD's foray into premium mini-PCs, the GPD Pocket, earlier in the year during its crowdfunding campaign. If you caught it before the deadline, US$399 as an early backer would have gotten you the 7-inch mini-PC. The early-bird price is gone, however, and the GPD Pocket has officially become available as a finished product for around US$500. The GPD Pocket is essentially a redux of the diminutive netbooks of yore, only this time with a focus on quality design and machining. 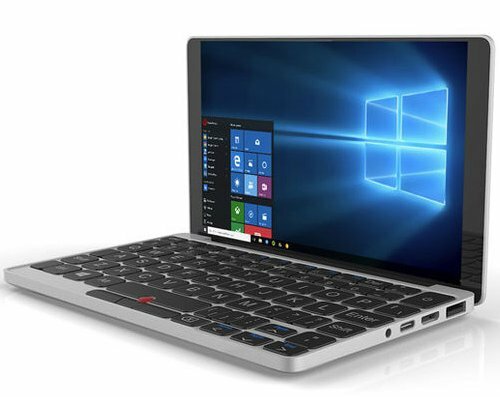 The GPD Pocket is CNC-milled from a block of aluminum and features a 1920 x 1200 pixel IPS touch-enabled display, 8GB RAM, 128GB eMMC storage, and an Atom x7-Z8750 CPU. It's enough power for most daily tasks, and the possibilities for productivity are aided by its complement of USB Type-A and Type-C and micro-HDMI ports. For input, the GPD pocket has a resized chiclet keyboard with a pointing stick rather than a trackpad. Reviewers don't seem to love the miniaturized keyboard, but its input seems serviceable enough for a device of its size, which is the GPD Pocket's main selling point. The Pocket measures 7.1 x 4.2 x 0.7 inches and weighs 1.1 pounds. Whether or not the novelty of a 7-inch aluminum-milled laptop is worth US$500 will probably depend on how much you love gadgets. If you're interested, Geekbuying and NewEgg (fulfilled by Geekbuying) are the sites currently accepting orders, which will ship in two weeks.